Following, identifying and deciphering animal tracks is a fun and interesting hobby for the old and new outdoorsman alike. While tracking can be done anytime of year, the easiest time is in the winter after a new blanket of snow has carpeted the woodlands. Even the most junior tracker, will enjoy following the easy to identify tracks of the varying hare, pursuing the tree hopping path of the gray squirrel or seeing the diminutive footprints of a field mouse quickly escaping into a burrow and barely missing the talons of an owl. Photographing animal tracks requires first finding good tracks. Mud and sticky snow (the kind ideal for snowballs!) create the perfect mediums for capturing “good” tracks. Ensure each track clearly shows the claws, toes and pads. The more detail you are able to pull from the impression, the better quality the rendered photo and easier it will be to identify any unknown tracks. Also, don’t focus looking only for larger tracks; sometimes mice, shrews and other small rodents leave great tracks as they stride along the snow’s surface. A small digital camera and a guidebook are all that you need to get started photographing tracks. A digital camera is vastly better than the film variety as it will allow a beginner to quickly review photos and make adjustments on the fly as necessary. Other “professional level” components like light reflectors, polarized lenses, tripods, separate flash/lighting units and high-end digital cameras can be incorporated as your interest and skill level grows. The most critical component of any good photograph is light. Low and harsh sunlight both create challenges when trying to photograph a track with definition. Use a flashlight to shine more light on to a track (low directional light makes a track standout) or if there is too much light use your shadow to shade it. While there are many “rules” to creating good photographs, as making sure the horizon is level, breaking it into thirds, etc. the most important rule is to have fun. Remember that photography should be an enjoyable experience. Don’t be afraid to experiment with different light and various angles. Try a low angle, to show the print in the context of its surroundings. Bring a bag of carbon black out, to blow on the print and heighten its features. Look online to get ideas and suggestions from other photographers. Only by playing and trying new and different options will you be able to become a better photographer. To properly size tracks, it is helpful to use a measuring tape. Having specific size references will assist you later in identifying the tracks or the tracks of different animals of the same type. In a pinch, pennies, shot shells, dollar bills or other items of generally known size, will help you and your viewers estimate track size. 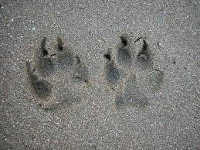 As you head out this weekend on your tracking adventure, I would be interested in seeing what you are able to capture. Please e-mail (rabidoutdoorsman@yahoo.com) any photos that you get and I will post them on the blog as a slide show. 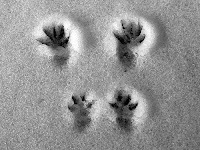 I will also be compiling a list of blog postings that highlight photographing animal tracks so send me a link and I will include below! Thanks and good luck! Excellent info post to your blog and thanks for the links..will be checking them out asap.. Excellent intro. Will this be an ongoing chain? Speaking of getting out there have you heard the rumors of the great Feb. Grand Lake ice fishing excursion? I wish . . . LOL . . . I think I expended my complete database of photographic knowledge in that last post! Maybe I can explore getting an "expert" to do a guest post!